Camera: Göran Gester, Michael Reiter, Nikos Andritsakis a.o. Swedish Film Institute - SFI. 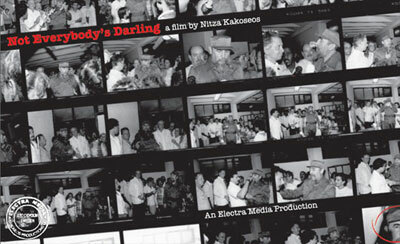 Not Everybody’s Darling is a witty and weighty documentary about a photograph. About a photograph of power and the power of a photograph. My photo of Fidel Castro travelled from Havana, Cuba, to Stockholm, Sweden. Now, some 25 years later, circulating the photograph again, creating a sequel to the story, a conclusion, in a new format – that of the documentary – is for me a major creative challenge. As a former war correspondent in Central America - the journalistic perspective in my work as a filmmaker is very present. All my films thus far have a strong journalist approach when it comes to choice of subjects, ambitious research and timing. I try to find dramatically - charged stories that start small but end up giving the audience the bigger picture. Not Everybody’s Darling is such a story, a drama with an edge and a razor-sharp wit.